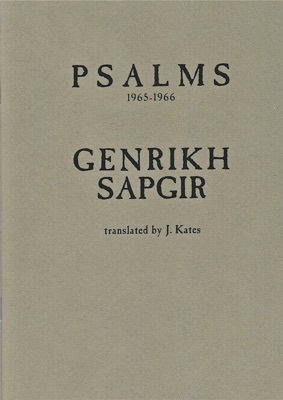 Genrikh Sapgir’s Psalms were written 1965-66, resetting the songs of David in the former Soviet Union. Born in 1928, Sapgir was one of the leaders of the influential Lianozovo Group of Underground writers in Moscow in the 1950s and 1960s. He wrote and published much-loved poems for children beginning in 1959, screen-plays for popular animated films, and scripts for both stage and screen. Until perestroika, he was able to publish little of his own. However from 1989 to 1999, more than 25 collections and chapbooks of his poetry appeared. In October 1999, he died in Moscow while travelling by trolleybus to a poetry reading.